Is this the wildlife manifesto for you? 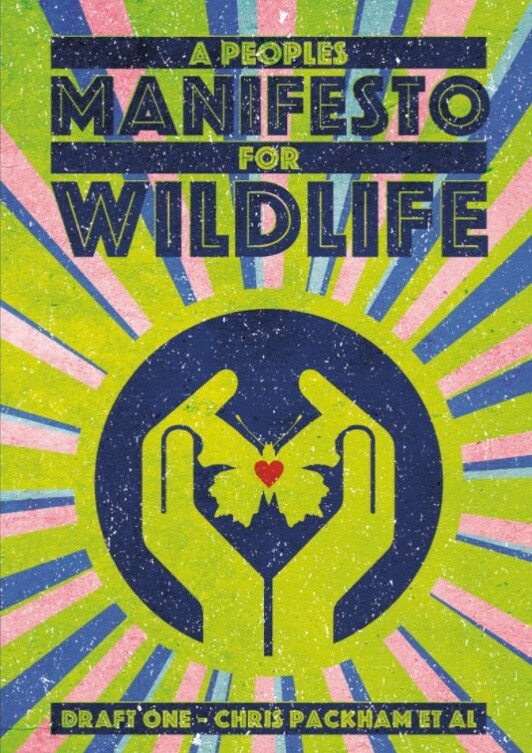 Is this the wildlife manifesto you’ve been looking for? Ahead of the Walk for Wildlife in Hyde Park on Saturday – assemble from 10am, chat and music midday-1pm and then a stroll down to Downing St – Chris Packham and friends have produced a Manifesto for Wildlife. Although I am one of the authors (I wrote a few words about the uplands) I hadn’t seen the full, illustrated version until yesterday morning. I was trying to read it on my phone while heading into London on the train. Considering that it’s been written by a bunch of busy people, as a favour to Chris and in the hope that it will set an agenda for a better future for wildlife, and in a very short period of time, it’s pretty good. At least I think it’s pretty good but what do you think? You’ll notice that it is described as Draft 1 – I can imagine it will be tweaked, enlarged and expanded over time. But what do you think? Calling this document a manifesto is quite appropriate. I’d vote for this, as a package, way ahead of what any political party will offer us at the next general election even though there are some bits I like more than others. Some of ‘our’ ideas are everybody’s ideas (they may well turn up in the election manifestos of several political parties), some of our ideas are accepted by many wildlife NGOs, some of our ideas are very new. Have a look and tell us what you think. There are gaps in the coverage of issues, but these can be filled, there are minor contradictions in the document between different authors (but no serious ones that I have spotted) and there are, no doubt, other ricks and glitches. But still, I think it’s pretty good, and a serious contribution to the debate – but what do you think? This manifesto was edited by three men of letters (and other skills and attributes); Chris himself, Patrick Barkham and Rob Macfarlane. There are contributions from others and the delightful artwork is by Harry Woodgate. There will be a few thousand free copies available at Hyde Park on Saturday. I was very impressed when I read it last night. I don't think it matters that everyone will want to put their own slant on it. The purveyors of "fake news" illustrated in the colour edition will have opinions on the manifesto far different from what any serious reader of it will think. It is the next step or steps which are important, and that should be commenced quite quickly, as undoubtedly new or amended legislation in all of the UK will be needed due to Brexit if it happens. The 200 points or proposals need to be put into a context of proposed legislation (new or amended) in my opinion, led in a public but moderated manner by senior conservationists but with input requested from all interested parties. There should be little difficulty in drafting serious and targeted legislation which reflects all the aspirations in the manifesto. The NGOs can play a major part in devising how this is achieved and put in front of politicians. If they adopt a joined up approach I would be very hopeful of some if not all of the aspirations coming to fruition. I can’t seem to find the link. Is it me or is it missing? I’d like to read the full proposals before responding. The media have reported this as Chris Packham’s own work, though clearly that’s not entirely accurate. It would be interesting to know which organisations were consulted, for example were Defra, the RSPB, the National Farmers Union all consulted? At least we finally have some clarification regarding the walk for wildlife. I’m still not attending for aforementioned reasons. Maybe you've seen different media from me, but one thing is certain Chris Packham has certainly not claimed it's all his own work. I doubt very much the NFU were consulted in fact they got a well deserved panning in the manifesto - no friends to the consumer, tax payer, wildlife, farm labourers or small farmers. The manifesto was for conservationists, real ones, to have their say unencumbered by anybody else's agenda (i.e pretend conservation) and about bloody time they did for once. You can lead a horse to water...but you cannot make it drink. Why comment on something you’ve not managed to read? Bit like that person who recently asked a question whilst saying they didn’t want to hear an answer as they wouldn’t change their view anyway. (Actually, I think that might have you too). Of all the contributions to the Manifesto, yours are the most radical and which seek to correct the mistakes of the past. Yes, our national parks are not worthy of the name. Downgrading and renaming to Upland Nature Areas (UNA) is consistent with the Addison Committee Report of the 1930’s, but you then have the guts to go further than that Committee in using money saved by subsidy withdrawal from UNAs for a land purchase fund so that more and more upland land is publicly owned. Further, you see maintenance of grants for environmental action on upland farms but only on the basis that each payment is a down-payment on eventual purchase by the taxpayer. You also recommend re-nationalisation of the water companies so that under public ownership, much larger areas of land would be managed for the general public good including recreation, biodiversity, carbon storage and flood alleviation.You added to this, a Public Forest Estate that would undergoing transformation to native woodland. As you identify, this increasing bank of publicaly owned land for nature needs a new Governement Agency to acquire and manage it for the future, bringing us into line with most other countries that also have a state-owned systems of land for nature. This Agency can then play a key role in policy development and action for this land bank being a test bed for reinstatment of former native species once it has undergone ecologial restoration. Your final proposal, of artificially maintaining small areas of overgrazed sheep walk in the Lake District and driven grouse shooting in the North York Moors as lessons to future generations of how wildlife-poor upland areas once were, may come across as being mocking. However, as all wildland enthusiasts will tell you, its not possible to develop a value system for wild nature without having a comparison. Up until now, that would be because there was no wildland to learn from, only wildlife poor upland areas. Given your proposals, the stark difference between wildland and the small areas of overgrazed land will be readily apparent, a salutary lesson that must teach us not make the same mistakes of the past. I'm trying to read the manifesto online but it's not easy. Sadly, I can't get to Hyde Park, so is there any other way I can get a physical copy for a reasonable donation to the cause? And if I can get hold of more copies, I can spread the word more widely. Even in our technological age, there are still quite a few people who will take more notice when they've a book in their hand. Roberta - you can download it online and print it out. The authors would be thrilled if you did. At the start it says its none political, then on the end paper, has a go at Sheffield city council! Why pick on them? There are many other organisation to also have a go at. Wendy - have another read because that isn’t what it says. It says it has no party political bias - and one rather witty mention of Sheffield trees hardly jeopardises that claim. Lower on the same page it says that is IS political. Of course it is - it is asking for change and calls for ‘swift and strong’ government action. The conflict pertaining to the felling/management of Sheffield street trees isn’t a joke. Nor is it a particularly environmental issue. Street trees, wherever they are, have almost all, if not all, been planted. Yes, potentially, they provide very important ecosystem services: (clean air, carbon storage, good mental health). But they also can (in summer) trap pollutants at street level; their maintenance (leaf sweeping, pruning) leads to polluting emissions; and, some people are stressed by the presence of the trees (the front of their house being denied the summer sun when the leaf canopy is at its fullest and others don’t like their garden walls being damaged by roots); those who are disabled or are pushing pushchairs find negotiating the root-ridden uneven footways difficult. So, trees have to be maintained to keep people safe (from falling trees and branches), protect property from damage, and enable people to get about. I don’t think anyone on either side of the issue would argue with that. The issue is how they are managed. The manifesto says its proposals are based on science. I’m not sure (having read around the subject a bit) the benefits of street trees are clear-cut. In some situations they provide certain benefits, in others, not. In referring to this issue on the back page of the manifesto, in what you say is a light-hearted way, is taking sides, possibly with people who want to undermine a Labour counci about an issue that is not environmental. For many protesters the trees are not particularly their concern - their right to protest is their concern. Yes, the council have made mistakes, they are not perfect, and I think the bloke who had the environmental portfolio didn’t know much about trees or the environment for that matter. But, nevertheless, it was they who were elected to manage the council’s budget. I know a couple of the Sheffield Labour councillors. They do not take this issue as a joke. They are being trolled - endlessly. They don’t want to prevent people from legitimate protest, having, in past times, been protesters themselves. They do want to spend council tax-payer’s money wisely. And, being Labour, they want to implement social justice as well as they can. Getting out of the contract with Amey (which, incidentally, was agreed by a previous administration) would cost a lot and the trees and highways would still have to be managed by someone. Councils have many calls on their meagre funds, not just looking after trees. Are the council, which were elected after all, to give in to middle class people just because they are pushy? Some of the protestors have broken court injunctions. Should the council let them get away with this? If they did then they are leaving the door open to having to give in to anyone who organises street protests against their policies? Surely, any council has to try to get its citizens to comply with the law, or we’d have chaos? Lots to debate there, i know! Most of the tree protesters come from the affluent west parts of the city (generalisation, but broadly true). They are not short of money or time (during the working week) to protest it seems. Policing their protests has cost a lot. I assume we council tax payers will be billed for that. The protestors are articulate, educated people who can raise money for their cause, get celebrities on their side, understand the nuances of the law. And people who could afford to pay for tree experts (several £100 a day i should think), to keep an eye on the Amey contractors who are charged with felling and pruning the trees. Meanwhile on the other side of the city are the less well-off people. Some of them have to manage a whole week on something akin to the amount the tree experts get paid for a day. There is a “thriving” food bank here. Plus, during the height of the tree protests, we on the east of the city were suffering from a plague of off-road motor bikes, cars, quad bikes, being driven on footways, through the local cemeteries and parks; damaging grassy areas intimidating people. I’m afraid my thoughts were; if the police weren’t over the other side of the city, supervising pretty, privileged protestors enjoying a frisson of excitement, whilst also protecting arboriculturists trying to do their job; they might be over here stopping young men being a nuisance. The manifesto has a page on fake news. There has been a lot of exaggeration about Sheffield street trees. If you stand on a hill near my house, there is plenty of trees to be seen, and they will still be there once the maintenance programme has been completed. Personally. I’d prefer the efforts of these protestors be put into protecting ancient woodlands and other “natural” habitats rather than street trees that they perceive to be adding value to their, already, relatively expensive properties. Or, they could go up to the moors and see what the gamekeepers get up to. Here’s a thing. The back of the manifesto for wildlife says it was not printed on paper made from Sheffield trees. I don’t know what has actually happened to the wood of the trees that have been cut down. I doubt it was made in to paper. Perhaps, it went to the wood-burning stoves of the tree protestors. To be frank, the appalling destruction of many 100s of perfectly healthy trees by that council is a total disgrace. Problem with this is that many of the wildlife conservationists don't care about wild animals as sentient beings. They have never spoken out against cruel sports and never will. If Chris Packham is so concerned about shooting why does he stay as a Vice President of the RSPB, an organisation which kills corvids in barbaric Larsen Traps and gives support to some forms of 'game' bird shooting and admits to shooting foxes. There is no mention of these inconvenient truths in this 'manifesto'. How many of the people on the list of authors have ever written a letter to the press about hunting with dogs? The conservation movement is full of people like Prince Charles who simply view wildlife as a thing, a number, with no intrinsic self worth as a living creatures That is why this manifesto does not add up. If it confronted head on the support which much of 'conservation' gives to cruel sports then I could take it seriously, but it does not. CT - so, Chris Packham doesn’t really care about animals? Interesting that you end up in the same place as the Countryside Alliance on this report. Happy with that? Are you Tim Bonner in disguise? Not saying that. I am saying that it is muddled up with the conservation lobby, which does not have the same aims and ethics as those of us who have long campaigned against cruel sports. CT - you’d be better off seeing conservation and animal welfare as useful allies in the bigger picture. Tim Bonner will probably ‘like’ your comment. CT, I agree that all animals (at least all vertebrates) should be regarded as sentient beings with certain basic rights. However I support the culling of certain species if there is clear scientific evidence that it has conservation benefits. Therefore I think what groups like the RSPB do is justified. As an extreme example what about rodents on remote islands that are destroying seabird colonies? Do we live and let live because rats are sentient beings? It seems that there is a fundamental contradiction between giving wild animals rights and culling them when there are clear conservation benefits. I'm not sure how to resolve this contradiction, and therefore admit that I'm being hypocritical by saying that wild animals should have rights, but it is also fine to kill them in certain circumstances. Matthew - thank you. You are not being hypocritical any more than you would be if you believed that free speech was a right but that it is constrained by laws of slander. But the problem that CT has in rejecting the package of measures laid out in the report is that if implemented it would deliver more of what CT wants than exists at the moment. I agree with much of what CT says. Because s/he has reservations about the manifesto does not mean s/he holds these views for the same reasons as the Countryside Alliance does. Marian - those weren’t reservations, they were rejection. And rejection would mean throwing out a bunch of babies with a few drops of bath water. If CY lives in a world where he has to ageee with everything to support any manifesto then I assume s/he never votes and has no friends (because they all have flaws). Thanks Marian. We will keep speaking out. We are not it seems supposed to reject a report that makes not a single mention of the support given by conservation groups to the killing of wildlife and cruel sports. I don't see the use of Larsen Traps or shooting foxes as 'small drops of bath water' either. CT - would you like to see driven grouse shooting banned? That’s one of the things you are rejecting but there are many others that you would also support (I’m guessing). Are you sure you aren’t Tim Bonner in disguise? "We are not it seems supposed to reject a report..."
That's a bit of a cry-baby comment isn't it CT? You have been allowed to express your view freely. That other people take a different view and express their disagreement with you does not in any sense dictate what you personally are supposed to do or not do. CT, surely the idea that this is a draft document and there is a clear request for more ideas makes it obvious that if you have any opinions then you must speak out. Let the authors know & it will all be considered. Maybe by the time the finalised report is publishes your concerns will be in there too. But don't dismiss an effort to get this all out in the public domain. The amount of work this must have taken & along with the walk on Saturday means in my opinion that Chris deserves better. It reminded me of a sweetshop ‘lucky bag’ - lots of my favourite fizz bombs, as well as some toffee I’d give to others. There’s something for everyone here, plus things you might not be keen on. It lasted me ten times longer than a lucky bag. And is free. Wonderful stuff. Well done to all concerned. Well said. In that sense it is like a party political manifesto. You would not necessarily expect to agree with every detail of the manifesto of whichever party you vote for but (if you base your choice on the manifestos rather than simple tribal allegiance) you go for the one you find is headed overall in the direction you'd like to go and/or with which you agree on the issues of most importance to you. The same is true here; it is worth supporting if there are more 'fizz bombs' than 'toffees', as you put it, and the overall direction it is leading us in is right. I think that is the case. I'm really enjoying the Ministry of Law Proposals from page 41 of the well referenced version of the "People's Manifesto", excellent contribution by Carol Day. The momentum must be maintained and the Government made to listen and more importantly ACT now not tomorrow or in 25 years time. This offering/contribution to the 'discussion' is too good to be left to the same fate as predecessors The State of Nature and Making room for nature? It's great to see this launched as a non-sectarian and inclusive campaigning tool. It's timely, too. This means that sometimes there isn't enough emphasis on how every one of these issues is of vital, everyday importance to the lives of people who are NOT involved in "conservation". It needs sharpening up/more emphasis on their impact on the everyday lives of the inner city dweller, of people who are preoccupied with finding money for this month's gas bill, or those struggling with mental health problems. If it helps the "conservation community" to speak with a united voice, the Manifesto will have been a huge success. In an ideal world, integral to this process would be making arguments that convince everyone that this is more than a well-organised special interest lobby. Michael - fair points, in my opinion. I'm a bit busy just now, but later today I may have time to prepare a set of blogs with a main section then divided only into a selection the various ministries, to separate out the the aims, ready for tomorrow morning. This may help those who agree with some portions but are passionately against others. My main aim is to show that rather than providing draft 2 etc we can go to an implementation phase quickly. Chris was certainly advocating that we do so. It is only a demonstration, and I will be using material from the manifesto and the podcast to bring everything together and trust that I will not be breaking any copyright that I should not. If we can get a conservationist to champion the then much smaller number of proposals, and politician to be the political advocate of a section, I would be hopeful it might work. I appreciate that persons like yourself, although you fronted a ministry, might find it impossible to take on a role. Indeed how you manage the number of balls you have in the air at any time amazes me. I'd like to see this move forward rather than discuss the document we have to death, and that is the reason I'm doing this. Loving the bit about how environmental payments are going to be a down payment on a compulsory purchase scheme on farmland Mark. When can we crack on with that one as as a farmer I can't wait. Once the state owns all the farmland you, Chris and Miles can be the land managers (good luck with that one) and I and the rest of us highly criticised farmers can take it easy. I thought that I might limit my activities to a few shopping runs for cheap and readily available provisions, bit of imported vino and then kick back and fire up the good old social media and start a campaign against the new something? Sounds too good to be true, can't wait. Julian - the 'chapter' is about the uplands... You farm in...? oh sorry my fault, I should have realised it was to do with the now socially acceptable second highland clearances. The new lairds of the social media finding their place in the modern world. Julian - yep, your fault. It is very long (over 140 pages!) and would have benefited from editing to provide more overall consistency. Where is the section on Local Wildlife Sites? These are the sites within 'Biodiversity 2020' which local people can connect with. LWSs are important for local wildlife engagement, yet not mentioned once. If they are, please let me know. Loved reading the Manifesto and agree with almost everything. Do agree with the person who said, "It needs sharpening up/more emphasis on their impact on the everyday lives of the inner city dweller, of people who are preoccupied with finding money for this month's gas bill ..." Discussed this with a few like-minded people of relative privilege and this point came up. Difficult to leave your lawn uncut, build your hedgehog house etc if you live in a high rise. So work needed on this. Agree with person who said NGOs need to join up in thinking but after searching the internet the only response I can find is from The Soil Association. I get the sense that everyone is waiting to see what other groups do. In fact, my local FoE colleagues said just that, "Let's see what the Wildlife Trust does." I don't think this is good enough, so how do you keep the momentum of the march going? Is there a public 'ideas' forum?